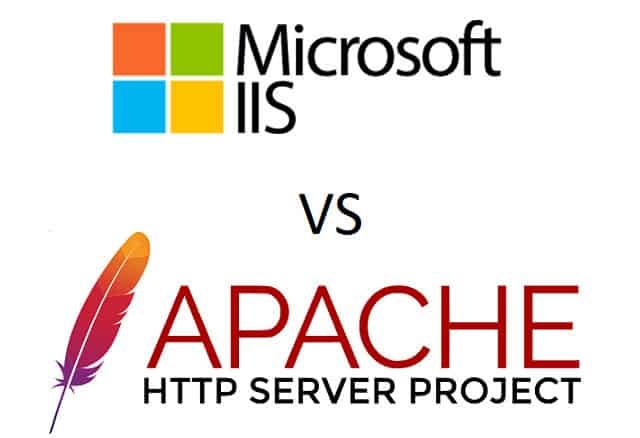 IIS vs Apache – which server platform is best for you? Web server software takes a lot of the work out of running your own Web sites. There are a number of Web application support options out on the market, but Internet Information Services and Apache HTTP Server lead the pack. According to Netcraft, IIS is the market leader in terms of the market share of all sites. In that league, IIS has 40.65% of the market, while Apache has 20.28%. In terms of market share of domains, Apache is the leader with 33.99% of the market while IIS has 26.36%. So, both of these options are very widely implemented. By comparison, Google’s Web server software is only installed on 1.39% of all sites. If you are kitting out a new server for your website, you are probably wondering which of these two systems to go for. In this guide, we will take a look at each option and explain the benefits of IIS and Apache. Armed with this knowledge, you will be in a better position to select both hardware and software to get your Web server operating. Microsoft’s IIS has a lot to recommend it. Although it is a proprietary system, it is based on a number of publicly-available protocols, which include the HyperText Transfer Protocol (HTTP), the Simple Mail Transfer Protocol (SMTP), and the File Transfer Protocol (FTP). So, the underlying technology of this system is compatible with standard Web interfaces all over the world. The software is backed by Microsoft and is frequently patched and updated to close off new hacker exploits. The security features of IIS have made it a safer option than Apache. As a commercial product, IIS competes in the marketplace with new developments that meet the needs of marketers. The tool is geared towards sales, which means it isn’t free to use. However, there is a limited free version, called IIS Express. The standard version of IIS is bundled in with Windows Server. A huge advantage of IIS is that it integrates with other Microsoft offerings, specifically .NET and the ASPX scripting language. Also, the management console is very slick and includes in-depth performance and analysis reports. In short, the choice of a Web server produced by a major software provider gets you a solid guarantee of cutting-edge security patches and an expectation of marketing-led features. The biggest detraction of IIS is that it is proprietary and not free to use. Another major factor that may make you decide not to opt for IIS is that it only works on Windows environments. If you have already bought a Linux server, then you just can’t use IIS. The Apache option is free to use and is an open source project. These two factors are great for keeping your startup costs down, but it also means that the Apache Foundation doesn’t have any money available to fund development. The development of Apache is all performed by enthusiast volunteers. You don’t get access to a help desk for assistance if you face problems getting any part of the HTTP Server to work. However, there is an extensive user and enthusiast community on the Web and this channel provides a constant stream of tips and updated warnings on how to get the best out of the Server system. The open source management of this option means you can comb through the code yourself and even adapt the software to produce your own customized implementation. Apache isn’t restricted to one operating system. However, it is better suited to the Linux environment. So much so that it has become part of a bundle of Web services solutions that are known as LAMP. This acronym stands for Linux for the operating system, Apache for the Web server, MySQL for the database management system, and PHP for scripting. This is regarded as the “out of the box” Web server solution and was the industry leader for a very long time. IIS has only recently overtaken Apache as the leading Web server system. You aren’t limited to PHP for scripting with Apache HTTP Server because it also supports Perl and Python. The core Apache can be extended to add on Transport Layer Security and cover HTTPS. Another add-on will give you FTP delivery capabilities. If your website is media-rich, you would probably be better off opting for IIS. The server integrates with other Microsoft products and has better methods of dealing with audio and video playback. Another reason that IIS would be better for media sites is that it uses a lot less processing resources for each connection and media file transmission can use up a lot of processing time. For portability, you would be better off with Apache HTTP Server. If you expect to trade in your server hardware any time soon, the operating system independence of Apache extends your purchasing options. Apache HTTP Server can operate on Windows as well as Linux. The reason that these two systems have very close market share is that there is very little difference between the two in terms of vulnerabilities and performance. There are many test results available on the Web that show that either one or the other has better response times. However, the results are usually very close and the winner in those tests usually turns out to be the system that the tester favored from the very beginning. The Web developer community is very clearly divided along the lines of Apache and IIS because programmers become adept in one language and one environment and employers don’t encourage them to cross over. So, your choice of Web server may lock you into one skills pool. The biggest influence on your choice between these two systems will be your existing hardware and software resources. If you are a startup with no premises or equipment right now, you are free to choose either of these systems. If you already have equipment that runs Linux, you are more likely to opt for Apache HTTP Server. Although Apache can run on Windows, if you already have your business based on Microsoft products, you already have onsite skills that are more compatible with IIS than Apache. If you don’t already have onsite resources, then you are open to the option of Cloud-based Web servers. A big advantage of these services is that they will include the server software. So then your decision making will be based on pricing structures, scalability, and other services bundled in with the Web server. Decision making is a difficult task and the fact that there is little differentiation in performance between IIS and Apache actually makes the choice even harder. However, there is an upside to this similarity. Both of these systems are well-established and widely-used. Therefore, there is little risk that whichever of these two you use that you would have made the “wrong” choice.